An ultimate fun-tastic celebration of pop culture in any galaxy, Fort William Historical Park (FWHP) is staging Fan-Con, July 18th to 20th. Fan-Con offers an exciting three-day extravaganza of sci-fi, super heroes, comics, collectibles, fantasy, gaming, plus concerts and camping, and much, much more over the jam-packed super-weekend. Headlining Fan-Con is Ensign Chekov, aka Walter Koenig, star of the Star Trek and Babylon 5, along with Daphne Ashbrook, star of the Doctor Who TV movie and Star Trek: Deep Space Nine. Also taking centre stage are megastars from Marvel Comics who will be making character appearances in two shows daily. Here’s your chance to have your photo taken with Iron Man, the Hulk, Spider-Man, and Thor. Special guests for Fan-Con will be Thunder Bay’s own superstar Staal brothers who will be on hand to sign autographs for fans of the National Hockey League. The concert stage will light up with David Wilcox, Chilliwack, Stampeders, and tribute bands, Simply Queen, KISS impressionists, Destroyer, along with AC/DC specialists, Thunderstruck. Once the concerts are done, everyone is invited to after-party gatherings at our astronomy centre where patrons can lounge beside the huge outdoor fireplace to enjoy music, food, and beverages, all adding to the festive activities. Fantasy fans are also invited to take advantage of our special concert and camping package available for the weekend. Be sure not to miss Fan-Con, July 18th to 20th at Fort William Historical Park. 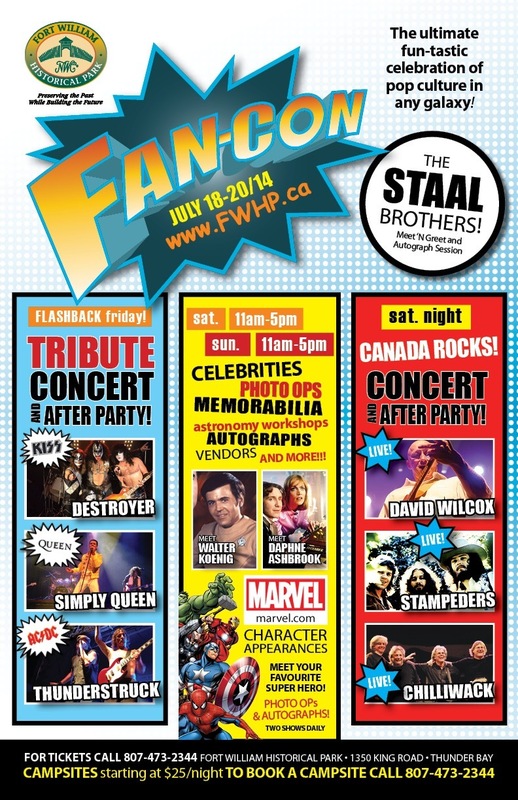 For information on schedules, ticket prices, and other details for Fan-Con, please visit www.fwhp.ca or call 807-473-2344.